You guessed it, this is another discussion of gear that went out of vogue decades ago. When I was in my late twenties, I was shopping for a new SLR camera and boy was the market plush with high quality sophisticated product. I remember going to the local mall camera store (later purchased by Ritz) with the intent of looking at a few cameras and was surprised to find the place packed with people lined up three and four deep at the counter waiting to handle the new wave of electronically controlled automated cameras (this was 1982). To further showcase the camera's capabilities, almost all were mated to very professional-looking power winders. Wow...just like a motor drive! Now for the benefit of our younger readers who don't remember a time when cameras did not wind themselves (or even when they required film to wind), there was a day when all photographers advanced their film by hand. All, that is, except for the owners of certain professional-level cameras who had the need for and the funds to justify motor-driven cameras. It was quite the status symbol to hold down your finger and burn through a full roll of film in a few seconds. In the middle to late 1970s, camera makers started making motorized winders that did what a true motor drive did, but did so at a somewhat slower rate (< 4 fps). These winders, while still not cheap, were much less expensive than a true motor drive. They were also not made to the same build standards as the pro models, but then again, they did not need to be. The three are arrayed with the bulkiest unit to the rear. While there is some difference in size, all weigh about the same (almost as much as the camera) with most of the weight being due to 4 AA alkaline batteries. The Pentax unit is the best made of the bunch with much of the grip being cast aluminum. The remainder of the Pentax is high quality plastic. The Ricoh units are plastic clad, but appear to have metal innards. As mentioned above, all three are noisy. Shooting with a power winder is not a stealth activity. 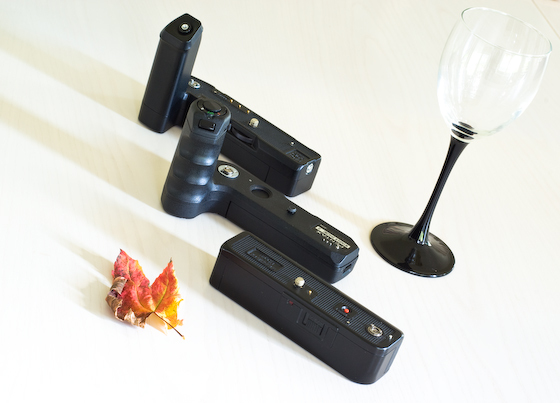 All three winders support both continuous mode and, except for the XR Winder II, a separate single frame mode. With both Ricohs manual shutter/wind operation is possible with the winder attached. With the Pentax, the situation is a little more complicated. There are several pages of cautions in the manual related to proper sequence for manual/powered wind and states where the winder may not operate as expected. Maybe I did not read carefully enough, but looks like there were some lapses in product design. It is a little difficult to see from the photo, but the combos are arranged from bulkiest on the left to most svelte on the right. The XR-2s is by far the heaviest and largest of the three cameras (about the same as a Pentax KX) with the Super Program being significantly smaller. The Super Program looks and feels tiny by comparison. The XR7 falls somewhere in between. Strangely, when paired with the winders, the spread is not so wide. The Super Program with winder is still tiny, but weighs about the same as the XR7 with winder. The XR-2s with winder is just a notch heavier than either of the other two. Well, what about handling? All three winders allow the camera to stand by itself by virtue of the grip or, in the case of the XR Winder II, a small foot that swings from the bottom plate. First place for handling goes to the XR7 with XR Winder II. Despite the lack of a grip, the camera is extremely well-balanced when paired to the winder. Next in line comes the XR-2s with the XR Winder I. The grip on the Winder I fits the hand nicely, with the trigger falling naturally to the finger tip. I would have given it the nod over the Winder II except that the surface of the grip is a little smooth for my liking. A little of the rubbery stuff and it would have been a lot better. And that brings us to the Pentax Winder ME II. As noted above, the pairing of the Super Program and Winder ME II was the most compact of the bunch. That compactness comes at a price and that price is that the grip is too small and the trigger is positioned poorly. A person with small hands might feel differently about the combo, but from what I can tell, your hand would have to be tiny to be able to have your index finger on the trigger and the rest of your fingers on the grip. This is truly a shame since the Super Program without the winder is easily the best handling camera of the trio, even for people with monster hands. The accessory grip for the Super Program body is one of the best for any camera, any brand, ever. Too bad, but finally getting my winders did not yield the degree of fulfillment I was hoping for. Fortunately, they were not expensive and serve to round out the historic aspect of each camera body. I am just happy that I did not stretch my budget to buy one back-in-the-day! BTW...While all three winders are spec'd at 2 fps, the XR Winder II seems to churn at a somewhat brisker pace than the other two with the XR Winder I being the most leisurely. The XR Winder II also takes the prize for easiest battery load and easiest to attach. The Pentax Winder ME II gets a special prize for the most unusual "feature". It has a small slider switch on the grip that MUST be used to sync the grip's trigger with the body's flash mode. Go figure. The Winder ME II also has one additional very cool feature that I was unable to try. It has a port that accepts a cord for tethered release. The optional cord is 5 meters long, but I expect that it might be possible to wire in some sort of intervalometer. amazing old camera with film.I agree that The Pentax unit is the best made of the bunch with much of the grip being cast aluminum. how do you get those camera? @Steve, fantastic photos with the wonderful stories behind the three winders. I also have the Ricoh winder and it is likely the same as yours on the Ricoh xr7. It does it job but I do find it too loud in usage. I also prefer the build from the winder on the Pentax SuperProgram. If you ever go into another film body, I highly recommend trying out the Pentax Pz-1(p) as it has the winder built in and it is a great Pentax film camera that look like a sibling to K10D. @LaRee, thanks for the visit and I didn't know you have the Minolta x700 as I have heard great things on the Minolta film cameras. I highly recommend indulging ourselves with occasional change for the film usage, you will be surprised. I recently bought various films as in Fuji Across 100, IlFord Delta 100 and 400, and now trying Kodah TriX 400, Tmax 100 and Ektar 100 for color. @DevDan, thanks for the visit and Steve is my wonderful blogging partner. I invited Steve to be my blogging partner as I love to learn from his film experience. 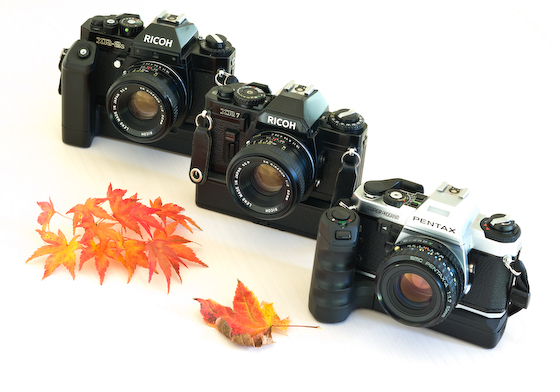 I got all three camera bodies on eBay. The XR-2s was $35 with the 50/2 and the XR7 was $20 with a Tamron 28-70 and Kiron 70-200. I traded both zooms for a CLA (they were pretty rough) and got the 50/2 for $20 at auction. The Super Program is a fairly new acquisition at and was essentially in like-new condition at $43, body only. I have had the Pentax-A 50/1.7 for a long time. A ME Winder II came along with a really cherry ME Super body that I "won"...I'm not sure I see myself actually using it though. One thing that bugs me a little about these is that they all basically move your hand away from the shutter speed controls. OK for Program or Aperture-Priority AE but stinky for manual or shutter-priority. A benefit is that it greatly improves the balance when using a compact M- (e.g. ME Super) or A-Series (e.g. Super Program) body with larger, heavier lenses like A35-105/3.5 or A70-210/4 which are kind of front heavy for these tiny bodies.